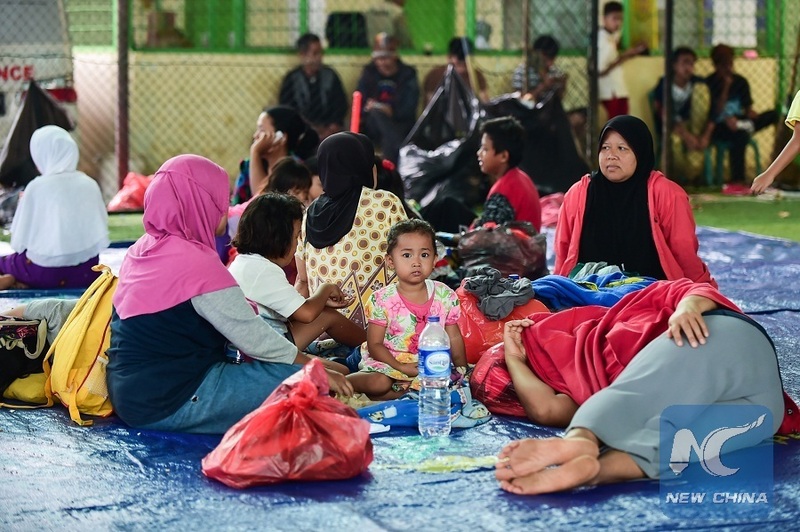 SERANG, Indonesia, Dec. 26 (Xinhua) -- Residents in Indonesia's tsunami-affected areas have refused to go back to their houses and crowded the shelter camps amid the fear that another tsunami could occur in the following days. The death toll from the tsunami triggered by a volcanic eruption in Sunda Strait of western Indonesia has climbed to 429 so far, with a total of 1,459 others injured. The tsunami, triggered by an underwater landslide after the eruption of Anak Krakatau volcano Saturday night, also destroyed 882 houses, 73 hotels and villas and scores of buildings along the coastlines, and displaced a total of 16,082 people. The tsunami that swept through Banten province's popular coastline of Anyer has deeply traumatized the residents there who recalled that they did not have any idea about a coming tsunami until the ferocious sea wave hit and submerged their houses on Saturday night. The rising number of the death toll from the tsunami has also amplified their fear for more possible tsunami strikes in the near future. The panic and fear from the tsunami still haunts old man Atok Sukani who now takes shelter in a big refugee camp in Banten's Pandeglang regency. He brought his 12 family members to the shelter camp for the fear that another tsunami may strike at any anytime. His house locates at Caringin village in the district of Labuan in Pandeglang's regency. "I will not let my wife and grand children stay in our house again until there is a further notice from the authorities that confirms the danger from tsunami is all over." "One of my sons was killed by the tsunami," the 80-year-old man old Xinhua on Tuesday in Rancateureup shelter camp in Labuan. He said that he could not attend his eldest son's burial due to his poor condition of health caused by the sadness of losing the son. "My son refused to come out of his house as he tried to prevent his belongings from washing away from the house by the tsunami. He told his wife and children to run out of the house for safety and not to worry about him." His body was found floating inside the house the next morning, Atok recalled with tears. Atok also went through hard moments while he was evacuated from his house. The weak old man had to sit in the back of a motorbike driven by his son to a higher ground a little bit far from his house. To seek a safer ground to stay, Atok has moved from one place to another and finally settled in Rancateureup shelter camp on Sunday morning. "I had been in this camp before it was officially used as a shelter camp." Although more families are coming to the camp and the camp will become overcrowed, Atok said that it is much better than going back to his house to live in fear. "The government provides enough food for us. That is quite fine as long as I feel safer here. But I have to get used to the cold breeze at night." The camp Atok is staying at has no walls. Concerned over possible slow reconstruction after the tsunami in Banten's coastline, the disaster-affected residents prefer to stay at the camp. "I have a baby and I have to pay more attention to his health and safety. Water caused by the tsunami has not receded from my house," Arawanah, a 26 year-old mother told Xinhua in the camp. Securing a mat in the corner of the camp, Arawanah stayed at the camp with her husband and two children. Even though they are well-fed in the camp, Arwanah hopes the government would speed up the delivery of formulated milk powder, diapers and other necessities for those infants in the camp. "I cannot find these necessities for my baby around here for the time being. My baby really needs the formulated milk powder which I haven't get since the tsunami," she said, adding she has already asked the regency officials supervising the camp to get milk for the babies. "That is all I need. I don't ask for more." Police officers have frequently came to the camp to inform the residents of the latest developments of the situation related to the volcano activities but there is no improvement. The Indonesian authorities have announced a 14-day period of emergency response in Banten's most affected regency of Pandeglang and a 7-day period in southern Lampung province.